The Spirit of Okanagan Lake, known to the Indigenous Syilx people as n’x̌ax̌aitkʷ (pronounced roughly as N-ha-ha-it-khu), is a sacred entity that embodies the significance of the water as a giver of life – something to be respected and revered. The translation is fairly literal, ‘N-ha-a’ meaning miraculous, wonderful, or divine; while ‘it-khu’ refers to ‘how it moves’, as in the movement of the water. The knowledge learned from the Scnewips Museum was invaluable to our quest to find the origins of the legend we know overwhelmingly as the Ogopogo and helped bring into focus the distinction between the spiritual aspect and the literal sightings of a reported lake monster. Today many locals refer to n’x̌ax̌aitkʷ as Ogopogo, a figure who has become prominent as a mascot for the valley as the ‘friendly’ lake serpent who has reportedly been the most photographed in the world. Everywhere in the Okanagan the familiar face is found, from Taxi companies to our local WHL team the countenance of Ogopogo leers out. But for the Syilx people, n’x̌ax̌aitkʷ brings to mind very different connotations that have existed for as long as oral tradition has been around (roughly 12,000 years of history). For the Syilx, the idea of n’x̌ax̌aitkʷ as the lake Spirit can be interpreted as a kind of recognition of the lake as the foundation of life and culture in the valley, as well as a significant tool for prayer. The spirit is by nature benevolent, preferring offerings of sage, salmon and tobacco from passerby as an acknowledgement of their relationship with the land and its supernatural inhabitants. This spirit is accompanied by a second known as ‘N’ha-a-ulo’, the spirit of the rattlesnake, which resides on RattleSnake Island, near Squally Point. This spirit, like n’x̌ax̌aitkʷ , can be appeased by an offering of tobacco, sage or salmon. However benevolent these spirits are one must be warned that to cross this section of the lake without these offerings would cause n’x̌ax̌aitkʷ to churn the waters with his tail, whipping the lake into a chaotic frenzy that can be dangerous for passerby. The origin story reported in Episode II of Into The Portal has a convoluted background that was clarified by Coralee, a local Associate at Sncewips Museum, upon our visit this week. Coralee explained that the story does not have origins in Okanagan Syilx culture but that she had heard of a similar tale of the cursed man, whose only friend was the rattlesnake. However, rather than being condemned to the lake for all of eternity the man was instead appeased by the spirit of the lake and transformed into a benevolent spirit referred to as n’x̌ax̌aitkʷ. This beautiful story points to the healing power of the water and its ability to restore and create balance, and in my mind explains why we don’t see poor unsuspecting tourists snatched off boats or mysteriously disappeared every summer. While the original essence of n’x̌ax̌aitkʷ is spiritual in nature, the sightings reported over the years lend themselves to a decidedly more literal interpretation. 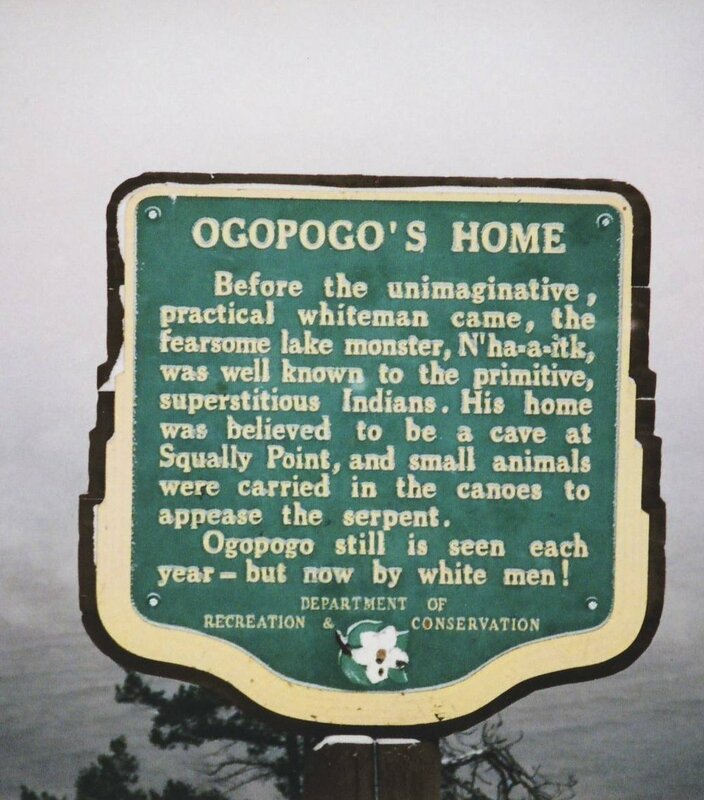 From Susan Allison’s lone sighting in 1873 to the masses that witnessed the creature off the shores of Mission Beach in 1928, it is hard to ignore the many indisputable reputations of those claiming to have sighted Ogopogo. Coralee herself had a personal account to share from her Great Grandmother, who reportedly saw the creature swimming in the waters more than once during her lifetime. These decidedly legitimate accounts support the idea that there is an unknown physical entity residing the waters of the Okanagan, further adding to the mystery of the legend.